The hotel was great, clean, and comfortable with a friendly staff. Breakfast was great. Gentleman who was working the breakfast area was fantastic! I would definitely come here again. Front desk attendants very efficient and helpful with recommendations. Room was clean, quiet and large. Hotel is close to heart of the city. The morning hotel receptionist was quite rude. Smiling and being friendly to guests would have greatly added to the value of our hotel stay. Beautiful room/comfy beds, lots of space, free breakfast, stylish design, large bathroom, nice pool and hot tub. Family friendly! The room was adequate, but the one chair was right next to air conditioning unit. Easy access to free shuttle and the park. Breakfast was better then most. The hotel staff was helpful and friendly. The room was very clean and comfortable. The location of the hotel was convenient. The gal that checked us in was very pleasant and helpful! Parking was easy and breakfast was good! We had only booked one night, but decided to stay another night at this comfortable hotel. The room was clean. It includes a huge sofa and all other necessary things. They have decent options for breakfast. Convenient stay for those visiting Arches or Canyonlands National parks. Overall, a very good experience. The hotel was very comfortable, clean, and the breakfast was wonderful. I only stay at comfort suites when I travel. This was a nice hotel and clean and very comfortable. We were able to sleep 5 adult sized people easily and the room had plenty of space you weren't tripping over anything to get from one place to another. Great place for families with teenagers. The breakfast was good and had a nice variety, and they did a good job keeping it stocked up. I selected this hotel for our family of four because it has queen-sized beds, it is close to downtown Moab, there is a heated pool and hot tub (really nice after a long day of hiking or biking). The beds and pillows were very comfortable. The room was spacious and well appointed. Parking, wifi and breakfast are included in the fee per night. Staff were accommodating. We had no needs beyond what was already thought of and provided for by the hotel. This was probably the best hotel I could've chose for my trip to Moab. the staff is very accomodating. The rooms were clean. The beds were so comfortable. The breakfast was pretty big. Loved the pumpkin spice waffles. There's complimentary coffee and tea all day long. Also loved the touch of makeup wipes in the bathroom. I got a big suite for a small price. It was very much worth it. Staying at a nice comfortable hotel with a great staff leaves a great effect on your vacation. Noisy room, not comfortable. OK for an overnight stay. An overall excellent facility but one front desk staff person was so-so. Nice pool, laundry room, breakfast and business work areas, etc. Perfect location for national parks (Arches and Canyonland) ...fun town...breakfast was standard, but good. Clean, comfortable rooms. Friendly, helpful staff. A nice breakfast was included with a variety of choices. Great place to stay. The place has only been open 4 months. We liked the breakfast offerings which included strong flavorful coffee, scrambled, sausage links and (fresh!) belgian waffles. The staff does a great job especially the girl managing the breakfast who keeps things moving along. Good job. 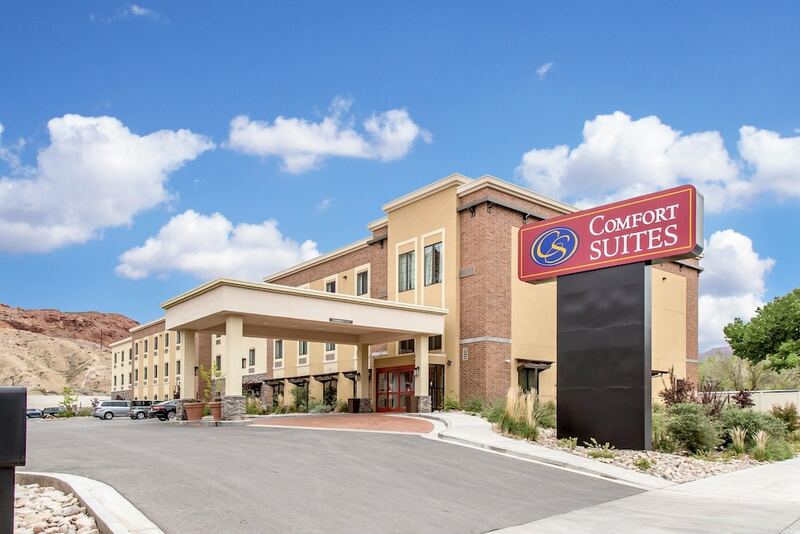 Located within a 5-minute walk of Swanny City Park, Comfort Suites Moab near Arches National Park is within a 15-minute stroll of Moab Information Center. This 75-room hotel welcomes guests with conveniences like free breakfast, free in-room WiFi, and free self parking. Free hot/cold buffet breakfast is included with your stay. A flat-screen TV comes with satellite channels, and guests can stay connected with free WiFi. Beds sport premium bedding and the bathroom offers free toiletries. Other standard amenities include a sofa bed, a refrigerator, and a microwave. At Comfort Suites Moab near Arches National Park, guests have access to a fitness center, a spa tub, and free WiFi in public areas. If you plan to drive, free parking is available. The front desk is staffed 24/7 to help with tours or tickets, securing valuables, and luggage storage. Additional amenities include a business center, free newspapers, and laundry facilities. great hotel close to two national parks. Free hot/cold buffet breakfast is offered. Recreation features at Comfort Suites Moab near Arches National Park include a spa tub and a fitness center. The preferred airport is Moab, UT (CNY-Canyonlands Field): 20-min drive, 17.8 mi/28.6 km.